We run six flagship Shine Centres that support seven schools. We have a social franchise model that has resulted in the establishment of 20 Shine Chapters in four provinces - the Western Cape, Eastern Cape, Gauteng and KZN. We provide training for volunteers, parents and caregivers to become learning partners to children. 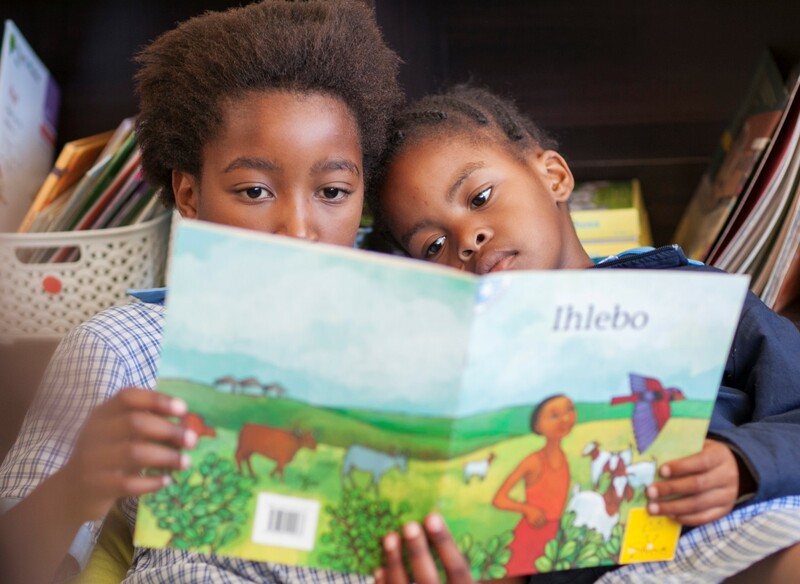 The highly scalable Shine Book Buddies Programme pairs older and younger children in schools together to enhance the reading skills of both. Many parents and caregivers choose to send their children to inner-city schools, far from where they actually live, in the hope of them receiving a better education. However, English is usually the language used to teach in these schools, which for most children, is a second language. Larger classes add to the challenges of children whose below the norm literacy levels put them ‘at risk’. 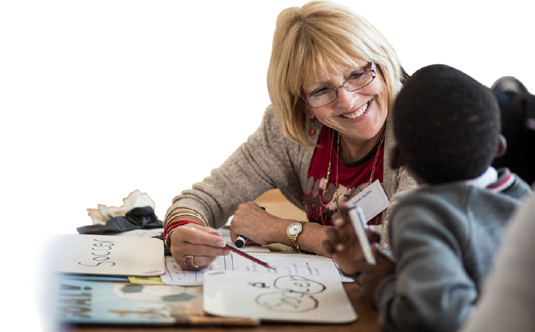 Shine Centres provide individualised support to children in Grades Two and Three (the Shine Literacy Hour) to strengthen their English reading, writing and speaking skills. 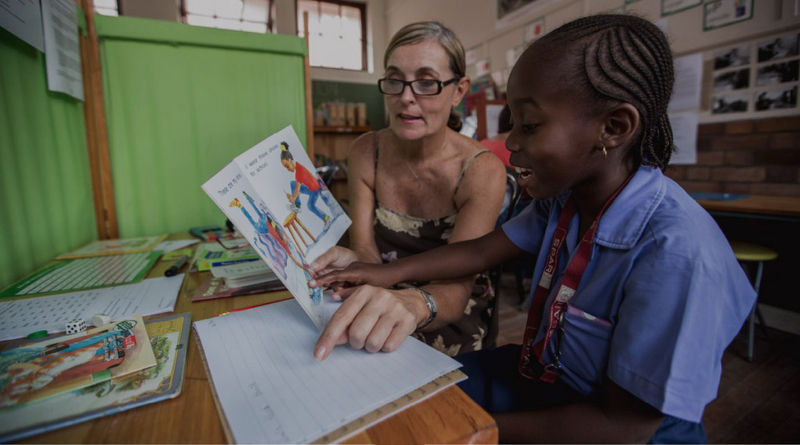 Children work with trained volunteers once or twice a week, during the school day, for at least one year. A simple assessment at the end of Grade One is used to select the children who will take part in the programme. Further bi-annual assessments enable children’s progress to be carefully tracked. Shine Centres bring benefits for the whole school, not just for those children who attend the programme. Grade R, One, Two and Three classrooms are equipped with multi-cultural age-appropriate storybooks to promote a culture of reading throughout the school. 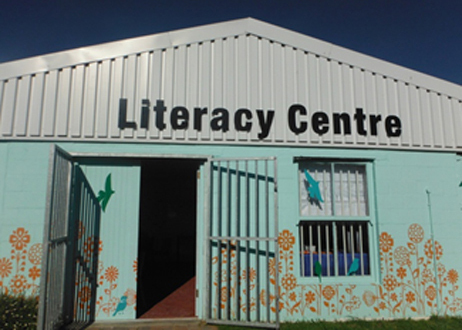 Shine also facilitates an annual Family Literacy Workshop at each school which is host to a Shine Centre. After many requests from individuals and organisations, we embarked on an exciting journey to find a way to replicate our model, without extensive financial and operational investment. This has resulted in 20 Shine social franchises in four provinces. We call these our ‘Shine Chapters’. Shine Chapters are social franchises that deliver the Shine Literacy Hour model but are run and funded independently. The Chapter Manager is responsible for recruiting volunteers and ensuring that the programme is delivered according to the Shine Literacy model. Shine Literacy provides initial training and resources, and ongoing support and monitoring. The Chapters are a smart solution for replicating our essential model, helping us to spread knowledge more widely and to reach far more children than we could on our own. This innovative model received recognition in 2013 from Impumelelo (Silver Award for Social Innovation) and the 2012 Rising Star Award (Africa-Middle East) from the STARS Foundation. Extensive research confirms that self-selected reading for pleasure results in profound growth in nearly all aspects of literacy, including reading ability, vocabulary, grammar, writing style and spelling. Children who read for enjoyment perform better in all subjects including Mathematics. 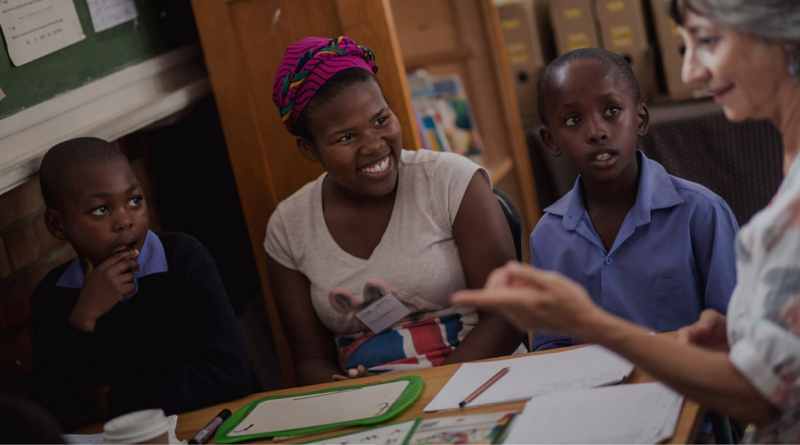 Shine Literacy created a new programme called Khanyisa, which means ‘to ignite’ or ‘to spark’ in Xhosa. 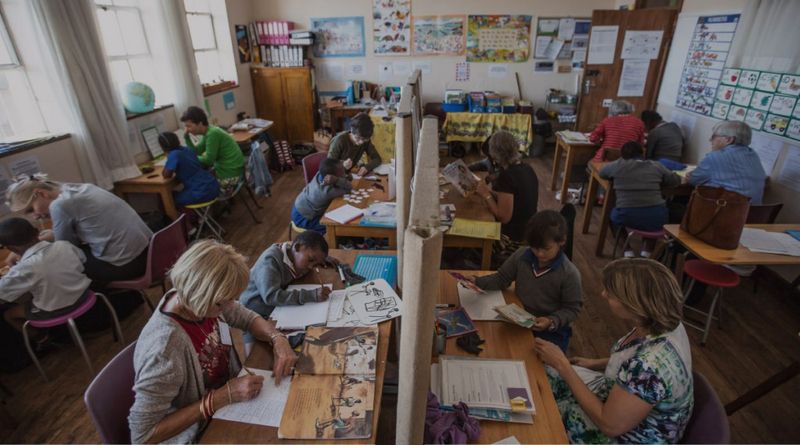 Partnering with Action Volunteers Africa (AVA) and the Western Cape Education Department’s 100 Schools Project, recent matriculants are recruited and trained in our reading methodology. 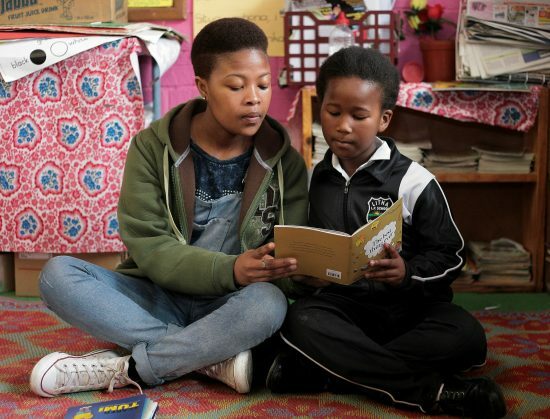 The Khanyisa programme involves placing youth in Grade Two classrooms for six months, where they are exclusively used as Shine Reading Partners. The objective of this programme is to assist schools in establishing a culture of reading throughout the school by increasing access to exciting books, training staff in ways to promote a love of reading and making reading a daily practice. The Reading Partner ensures that each child in the class has an individual paired reading session at least twice a week. Additionally, the Reading Partner reads a story to the whole class at least once a day. In 2017, 90 youth were trained in our methodology and placed in every Grade Two classroom across 24 schools. We established reading corners in those 90 classrooms and approximately 3500 children benefited from having a Shine Reading Partner in their classroom. See our report on our findings here. 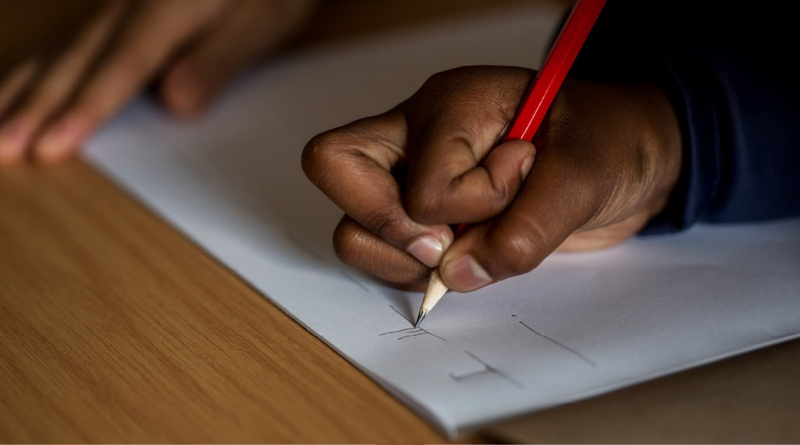 Shine Literacy’s Theory of Change aims to get more children reading and writing at an appropriate level by delivering programmes that increase children’s access to quality literacy learning opportunities and resources. We realise that only by working in partnership with others can we accomplish our vision of a nation of readers. 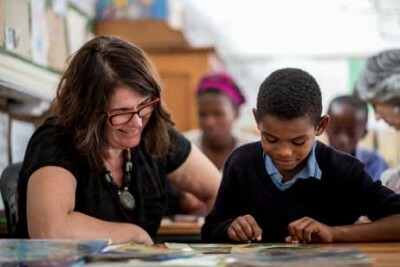 YearBeyond or YeBo is a partnership between the Western Cape Government and numerous NGOs aimed at improving educational outcomes and encouraging a culture of volunteerism. This programme uses recent matriculants as Learning Partners. The youth are trained in our reading methodology to provide individual support to young children in low-income communities in an after-school setting. Youth receive stipends via the Jobs Fund, and participate in leadership and self-development courses to prepare them for the job market. Volunteering with YearBeyond is a full-time, five day a week commitment, and volunteers are busy from 9am to 6pm every day. They complete their self-development programme in the mornings, and are transported to their school in the afternoon to run the after-school education support and learner development programme. 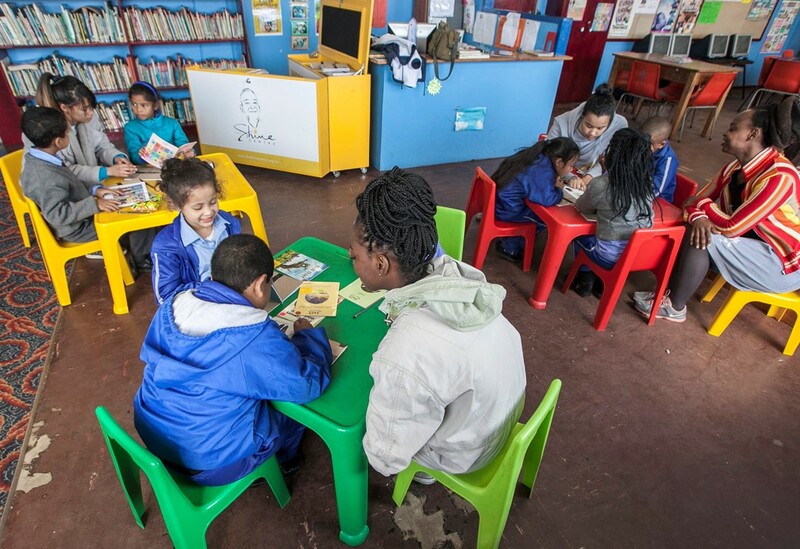 In 2018, 60 youth are running elements of the Shine Literacy Hour programme in 12 primary schools in Khayelitsha, Mitchell’s Plain, Gugulethu, Manenberg and Phillipi. The Shine Book Buddies model pairs older and younger children in schools together to enhance the reading skills of both. They meet two to three times a week for 15 minutes and do paired and shared reading – methodology also used in all Shine Centres during the Literacy Hour programme. Carefully selected readers (books) are offered in English and/or the mother tongue of the children. This simple, yet highly effective programme, can be facilitated by class teachers, and easily incorporated as a school-led initiative. The Masikhulisane Book Buddies programme is a bi-lingual, cross-age reading for enjoyment programme which was inspired by Shine Literacy’s methodology. Working in partnership with Masikhulisane, five schools in the Eastern Cape are running this programme in 2018, with Shine Literacy serving as the overseeing partner. It emphasises the importance of developing a love of reading in children, using a bi-lingual approach to ensure that children have the opportunity to read stories in their home language and in their first additional language, and pairing children to read to each other thus drawing on the available resources of proficient readers in the school. Recent research has highlighted the positive, yet unintended benefits that result from this type of initiative, namely: children from different age groups building friendships (which can benefit an entire community); older children having the opportunity to model good behaviour to younger children which can boost their self-esteem; and children are less likely to take part in bullying and they learn to work collaboratively (Boud, 2002; Developmental Studies Center, 1996; Topping et al., 2011; Juyonen & Graham, 2001). We have developed creative ways to enable our programme to be used by others through our comprehensive offering of training workshops. We share our ethos and methodology, enabling interested parties to establish Shine Chapters (social franchises), Reading Clubs, a Shine Book Buddies programme, or to transfer vital skills through Family Literacy Workshops to parents, teachers and community-based organisations, who are then able to effect change. Literacy Hour Training is for anyone who would like to become a Shine Literacy volunteer. These workshops take place on a monthly basis, usually on a Tuesday, from 11:00am – 3:00pm. Contact Trudy on 021 762 4320 or info@shineliteracy.org.za for more details. We engage regularly with our existing volunteers to deepen, broaden and refresh their knowledge on carefully selected topics. We invite guest speakers to talk about their areas of expertise within the broader education field. Shine’s Family Literacy Workshops seek to equip parents and caregivers with the knowledge and skills to help them better support learning in the home. The workshops build on parents’ existing understanding, helping them to value what they know and to embrace their vital role in their child’s education. Tips, practical ideas and new resources enable parents to develop a repertoire of strategies and tools for helping their children to become successful readers and writers.